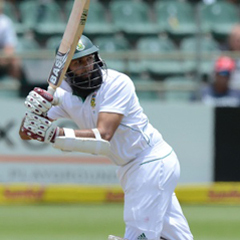 Johannesburg - Hashim Amla has been rewarded for his form against the touring Black Caps, rising one place to second in the International Cricket Council's Test rankings for batsmen. Amla leapfrogged Shivnarine Chanderpaul of the West Indies in the latest ratings list, released on Tuesday, and closed the gap on Australian leader Michael Clarke to just one point. The Proteas top-order batsman made 176 runs, including a half-century and a ton, in South Africa's comprehensive 2-0 sweep of New Zealand in the two-match Test series which ended in Port Elizabeth on Monday. Also among the top 10, AB de Villiers and Jacques Kallis swapped places, with the former moving up to sixth and the latter dropping to seventh position. Further down the list, the two other centurions from the second Test at St George's Park, Faf du Plessis and Dean Elgar, soared up the rankings. Du Plessis climbed five places to 38th, while Elgar, who found some much needed form in his third Test innings, moved up 49 positions to 96th. Meanwhile, paceman Dale Steyn consolidated his place at the top of the bowlers' rankings, taking 13 wickets at an average of 11.53 in the two Tests. Countryman Vernon Philander clung to second place, despite missing out on the second match due to injury, while Morne Morkel remained in eighth spot. Spinner Robin Peterson shot up 15 places to 50th, and seamer Rory Kleinveldt rose 17 positions to 74th. Veteran Kallis retained his place at the top of the all-rounders' rankings. South Africa cemented their place at the top of the ICC Test Championship table, opening a six-point lead over second-ranked England.